Or should that be "with great power"? If you’re not aware of it yet, the use of “drones” (unmanned aerial systems) to take aerial photographs of a home or property for sale is still not legal, well, not completely legal. Currently, realtors can apply for what is known as a Section 333 Waiver which is a limited use permit for using a remote controlled drone for this purpose. At present there is no comprehensive legislation regulating what can and cannot be done and strictly speaking, using a drone for the purpose of aerial photography is against the law in the U.S. There are also the safety considerations to consider. Who would be responsible if the drone simply fell out of the sky and hurt someone, or damaged property? The good news is that the FAA (Federal Aviation Administration) is currently addressing this issue and hopefully legislation will soon be passed that will make the process much quicker than it is now. Some applicants currently applying for the waiver have had to wait as long as 170 days to obtain their permit. To date the FAA has received more than 1,200 applications but is only able to approve between 20 – 40 applications a week at this point. Obviously this will need to change if applicants will be able to obtain approval within a reasonable amount of time. Although most of us probably agree that too much regulation is not necessarily a good thing, I feel in this case it is definitely required. First of all, I simply don’t like the idea of just anyone being able to maneuver a “flying camera” just about anywhere they want to. If you think about it, the potential for abuse is huge. These types of drones could easily peer into a 2nd floor window, even from a distance and what about someone “watching” our children playing in their own yard or actually “following” them to school? Other concerns about the proper use of this type of technology would include flying too close to an airport or too high in any location and possibly interfering with low altitude aircraft. 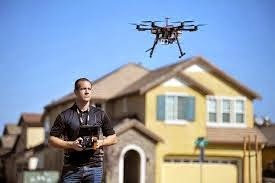 Everything said and done I find the use of drones in the real estate industry to be an exciting step forward. Using this type of technology we can now affordably provide some great photos of properties for sale to prospective buyers, especially larger properties in rural areas. I also believe that entrepreneurs can find many opportunities using this equipment. This is a great service to provide to realtors throughout the country but until the FAA (and the insurance companies) decide exactly how we are to go about this, it might be better to wait.